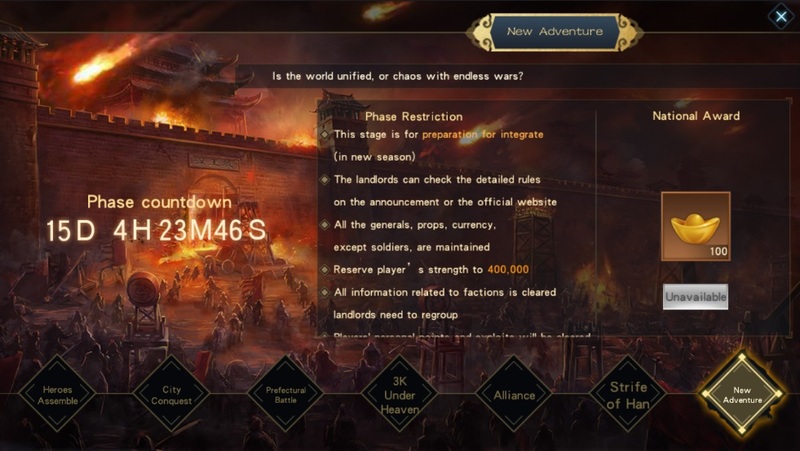 As you know after Battle of Luoyang, the system will automatically go to the next phase which is "New Adventure" (Please check Rule the World). This system will merge other server into 1 main server to bring new enemy or new friend into new world. To make sure all of you understand this system, please take a look this detail description and please read it carefully. • It’s time to betray your country. 2. All of the player’s items are retained, including jade, ingot, resources, experience, generals, equipment, building level, technology, backpack items, achievements, mission progress, and drill progress. • Event progression is not saved. • Growth Fund, VIP Card, Assist Gov’t, Monthly Card will not reset. • Building upgrades, technology research, forging, and foundry time schedules are recommended to be retained. • Hospital directly removes wounded soldiers. • Training camp and Hospital, if possible, will be retained. 4. Blacklist friend list will be cleared. 5. All mails will be deleted, please claim rewards in advance! 6. If there are 2 or more players with similar character name, the server number will be added after the name (e.g. PlayerName_1). •• If the highest level total troops are less than the number to be retained, all will be retained. ••• For example, retained 100k; The ratio of the number of each soldier is 4:3:2:1, and the last number of each soldier retained is 40k, 30k, 20k and 10k. 8. Faction information removed (Faction EXP, Faction level, Faction Tech, Personal points, Battle Power), Faction members need to regroup again on new journey, you need to enter the game as soon as possible to claim your Faction Name! According to the rank of faction, each faction member will receive a Faction pack (including Faction EXP, personal points, and power contributions) before the end of the season. 9. The new season will open new stages, new features, new gameplay. 10. When the new season starts, you can freely move around the world. 12. Officials will merge servers that have a similar or close opening date. 14. 8 days before the start of the new season, officials will announce servers that need to be merged, so everyone will have time for preparation. • Servers with the latest opening date will get a Gacha event as a reward to compensate for the differences in heroes that they have compared with the older servers. 1. After the new season starts, Each faction member will receive a Faction pack according to the level of faction, different levels will receive different pack reward. 15. After the new season starts, each Lord that occupied County, Prefecture, Country and Luoyang in the previous season will receive a Tally. • Lord of Luoyang will get “Jade Seal Heirloom” ，Increase led troops by 5500. • Lord of Wu will get “King of Wu's Tiger Tally” ，Increase led troops by 4500. • Lord of Shu will get “King of Shu's Tiger Tally” ，Increase led troops by 4500. 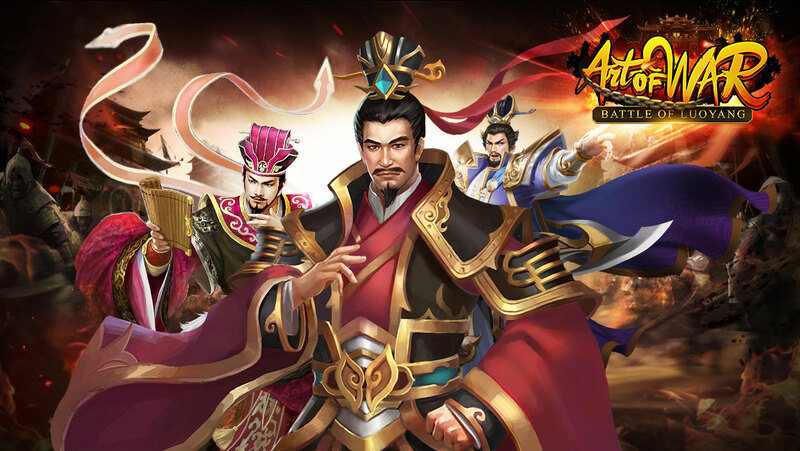 • Lord of Wei will get “King of Wei's Tiger Tally” ，Increase led troops by 4500.